South Padre Sport Fishing Charters with Captain Todd Lohry. Offering anglers the finest South Padre Island deep sea sport fishing available for inshore and offshore fishing trips. South Padre Island fishing, from the area of Laguna Madre south to Port Isabel into the warm waters of the Gulf of Mexico offers great sport fishing action year round. The South Padre Island fishing grounds and Texas saltwater fishing regions are famously known the world over for being some great places to fish with extremely plentiful recreational marine resources. As one of America's top fishing vacation destinations a visiting angler on a South Padre sport fishing charter or any Texas saltwater fishing trip can expect to catch any one of many top big game sport fishing species. South Padre Island charter fishing offers a wide variety of big game offshore sport fishing species to target. From the REEL Madness, pictured at left you will go on the hunt for big blue marlin, a fish that will test even the best anglers physical stamina and mental fishing skills. Or you will target tuna, a fish that will feel more like a torpedo on your line than a fish. Yellowfin tuna will hit hard, go deep, and take line from your reel in such quick fashion that your reel will scream as the line is stripped off. South Padre marlin fishing and tuna fishing is just a small taste of the overall deep sea fishing that Captain Todd and REEL Madness sport fishing charters offers. A big marlin or hard fighting tuna may be exotic and exciting fishing action but there is so much more to experience on a South Padre fishing trip. There are wahoo, dolphin, sailfish, and more to catch and that's just the Texas offshore fishing. We haven't even mentioned the readily available and rich marine resources you can target in South Padre's inshore fishing regions. Stay up to date. Like us on facebook. Todds Sportfishing abord the Reel Madness. The South Padre Island fishing grounds and Texas saltwater fishing regions are famously known the world over for being some great places to fish with extremely plentiful recreational marine resources. As one of America's top fishing vacation destinations a visiting angler on a South Padre sport fishing charter or any Texas saltwater fishing trip can expect to catch any one of many top big game sportfishing species. Ask about Dolphin watch/Boat ride. / 2hr min. South Padre Sport Fishing has many choices for charters... check them out. 3. Weather and cancelation policy? ♦ We watch the weather. If it is not going to be good I will give you a heads up to reschedule. Deposit is refunded unless no show. I will make the most informed decision prior to trip. 4. We aren't experienced offshore. ♦ That's fine call captain. Todd 956- 299-0444 to get advice on your perfect trip. 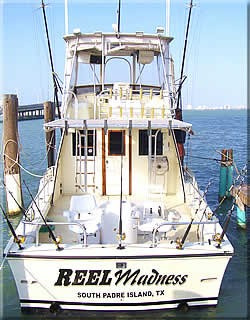 ► The REEL Madness is a 38' sportfishing vessel with plenty of fishing room that will make your trip a comfortable one. This South Padre Island charter boat features full air condition for your complete comfort. ► Powered byTwin engines the REEL Madness is loaded with all the latest elctronic fishing and safety gear. ► We use the best gearand tackle available with Penn International and Shimano rod n reels. ► We can accommodate up to 6 personsper trip, corporate charters, and of course children are always welcome. We provide a professional and courteous atmosphere so you can enjoy your South Padre Island or Texas sport fishing trip to the fullest. Reserve a Texas Sport Fishing Trip TODAY!